World No. 1 and two time defending champion Novak Djokovic eased past Frenchman Paul-Henri Mathieu 6-2, 6-4, 7-5 to kick off his title defence campaign. 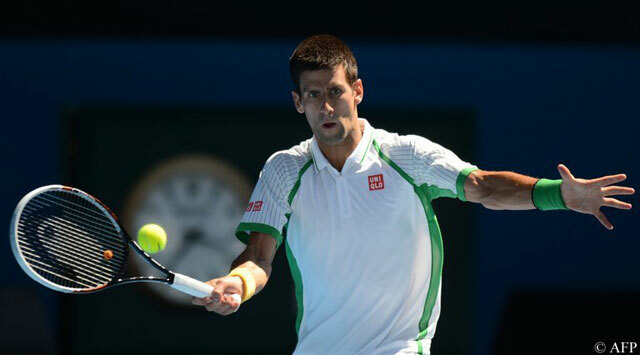 Djokovic is aiming to become first player in the open era to win 3 consecutive Australian Open titles. He did not lose his serve during the entire match. He will face American Ryan Harison in the second round who defeated Santiago Giraldo 2-6, 6-4, 7-5, 6-4. In another match, Spaniard Fernando Verdasco rallied from 2 sets to 1 down to beat David Goffin 6-3, 3-6, 4-6, 6-3, 6-4 in three hours and 22 minutes to book his place in the second round. Fourth seed David Ferrer had an easy outing as he defeated Belgium’s Olivier Rochus 6-3, 6-4, 6-2. Ferrer has won eight of his first nine matches in 2013. He has won the Heineken Open title in Auckland for the fourth time last week (d. Kohlschreiber). Local hero and 2005 Australian Open runner up Lleyton Hewitt’s 2013 Australian Open campaign was ended by Serbian Janko Tipsarevic 7-6(4), 7-5, 6-3 in the Rod Laver Arena night session. Hewitt had a chance to win the second set as he served for the set at 5-4. However, Tipsarevic fought back to win three straight games to take the second set. He maintained the same momentum in the third set to take 3-0 lead. However, Hewitt tried to recover and he did, leveling 3-3, but the recovery proved to be short lived as he was broken in the eighth game before Tipsarevic served out the win. Upset of the day came when World No. 79 Andrey Kuznetsov defeated 11th-seed Argentine Juan Monaco 7-6(3), 6-1, 6-1 in just under two hours. It was the biggest win of the Russian’s career. He will play SA Kevin Anderson in the second round who defeated Italian Paolo Lorenzi 3-6, 7-6(3), 6-3, 6-4. Comeback of the day was done by Russian No. 23 seed Mikhail Youzhny who rallied from two sets to love down to defeat Matthew Ebden 4-6, 6-7(0), 6-2, 7-6(4), 6-3. He saved one match point at 4-5 in the fourth set. Polish Australian Open debutant Jerzy Janowicz registered first win against Italy’s Simone Bolelli 7-5, 6-4, 6-3 victory over. He will face India’s Somdev Devvarman in the second round who dismissed German Bjorn Phau 6-3, 6-2, 6-3. World No. 6 Tomas Berdych had a convincing straight sets win over Russell 6-3, 7-5, 6-3 to move through to the second round.